Meet Crystal Esprit®—the world’s newest, most luxurious all-inclusive super-yacht. 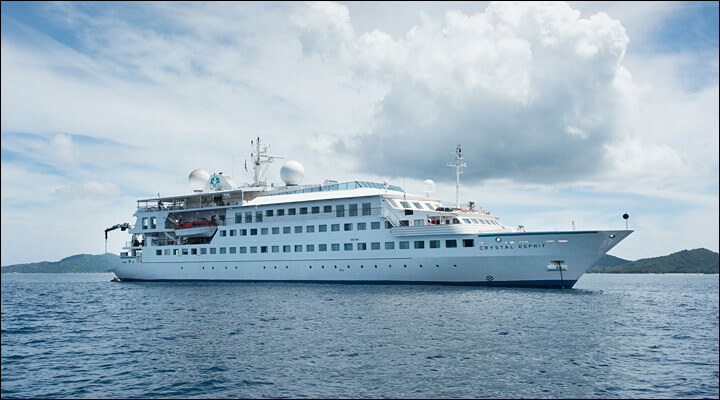 Debuted in December 2015 in the verdant Seychelles Islands, discover The Crystal Experience® in a far more intimate setting with just 62 other intrepid global travelers. A host of water sports to be will be enjoyed from the yacht’s marina platform—swimming and snorkeling, water skiing, wake boarding, kayaking, jet skiing—always with top-quality equipment and instruction. Indulge in the ultimate extravagance aboard optional state-of-the-art deep-sea submersible for underwater exploration, or a Wider 32 super-yacht tender to feel the wind in your hair. The choices—as always—are exclusively yours aboard Crystal Yacht Cruises. When the sun goes down, the lights come up, and your evening aboard Crystal Esprit is just getting started. From gaming in the casino, sipping cocktails in the Cove, or a dip in the Jacuzzi® beneath a blanket of stars—indulge in the nightlife of your cozy home upon the sea.